“Can this client afford this surgery without experiencing a hardship?” Sometimes, a client’s financial situation is the reason the patient is experiencing the issue in the first place. Take, for example, an intact female who needs a radical bilateral mastectomy because her owner thought a spay was too expensive 10 years ago. Some clients can’t even afford to buy a leash, and their dog ends up being hit by a car. Educating our clients about (good) pet insurance plans should start early. Regrets don’t help much the day of surgery. The next best option is financing, sometimes with extravagant interest rates, which only compound the problem. 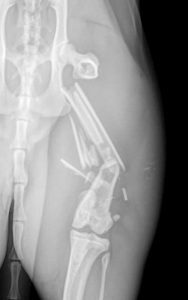 Is it possible to repair this severely comminuted femur fracture in a two-year-old cat? These questions arise when a dog should have a TPLO, but its owner can only afford a nylon suture repair. Or when a client can’t afford a fracture repair, and amputation is mentioned. Or when a 150-pound dog needs a total hip replacement, but the owner can only afford an FHO. “Am I putting my reputation on the line by helping this difficult client?” Ever had a client who told you: “This better work out or I will sue you!”? We always do our best and we always take the necessary precautions with every patient. Once a pet owner verbalizes this threat, are you willing to perform the surgery? Not because the procedure will be performed any differently. Not because we are especially concerned about making a surgical mistake. But because there are factors we can’t control. Surgeons live with Murphy’s Law. And surgeons are highly allergic to frivolous lawsuits. Worse: Complications seem to happen to patients owned by these types of clients. Experienced surgeons are not easily distraught by a surgical setback. This doesn’t stop the question, “If this goes south, can I fix it?” from crossing our minds. “When is good good enough?” Surgeons are married to compromise. During a difficult fracture repair, is 95 percent good enough? How about 98 percent? Is that minor misalignment acceptable? Is it worth another hour of anesthesia to get perfect anatomical reduction? Be a gardener, not a carpenter. When debulking a large tumor, there comes a point when we have to accept we are not going to achieve perfection, and cancer cells will be left behind. “Can we handle this patient?” You can have the best low-stress handling practice in the nation, but there still will be “challenging patients” (code for pure evil). Will we be able to provide adequate care before and after surgery? Am I willing to put my nurses at risk? Will we be able to change the splint once a week? Can we even give an injectable sedative to this patient without getting hurt? “Can the owner follow my discharge instructions?” “Will they?” If a client refuses to restrict activity postop, or declines the E-collar, or refuses to commit to weekly splint changes, or the patient outweighs them, should the surgeon decline surgery? Of course, the surgery is medically indicated or maybe even required. What’s a surgeon to do? These are some of the things we lose sleep over. “Is a surgical revision the right thing to do?” Surgeons sometimes have to fix someone else’s mess. Although our job is to fix things, is a revision the best option for the patient? For example, if a fracture repair failed, can it be revised successfully, or is amputation the wiser option? And if the owner declines amputation, should we recommend euthanasia, or still attempt a repair that may not work? “Should I perform ‘elective’ surgery in a cancer patient?” Recent examples include a Labrador with multiple myeloma and laryngeal paralysis** and a cat with lymphoma and an ACL tear**. As long as the patient is stable and the cancer is under control, it can seem appropriate to perform the surgery to maintain their quality of life. Still, it’s an ethical dilemma every time. “Is it best to postpone the surgery?” Deciding to postpone a surgery is an agonizing decision for a surgeon. But there are circumstances where it might be the best option for the patient. Case in point: a morbidly obese dog with bilateral ACL tears who needs staged TPLOs. Will the 80-year-old client be able to sling walk this dog several times a day for many, many weeks? Should we do surgery right away to speed the recovery process? Or should we be patient and help him lose weight first? Sometimes the decision is not that easy. “What’s the best approach for this patient?” When in doubt, the best strategy is often to brainstorm with another surgeon or another specialist (e.g. internist, neurologist, or ultrasonographer). This enables confirming a diagnosis, discussing various approaches and debating pitfalls. This meeting of the minds enables coming up with the best strategy for the patient. The most difficult decision of all may be, “Should I abort this surgery?” Sometimes, the outcome may not be favorable despite our best efforts. Maybe a procedure is above our skillset and the patient would be better off in someone’s more experienced hands (yes, even a surgeon can be a victim of the impostor syndrome). Or is it fair to perform a “half-face-ectomy” or a hemipelvectomy with hind leg amputation? Or perhaps it’s a gut feeling that surgery is not needed. Maybe more diagnostics are warranted. Or worse: when everything points to a torn ACL, the patient is on the surgery table, you repeat your stifle exam, and at the last second, you question whether the ACL is truly torn. Do you wake the patient up? This can be the most intense internal struggle. Surgeons have as many hesitations and questions as other specialists and general practitioners. Changing your mind is perfectly acceptable as long as you put the client, the patient, your team, and your ethics on the forefront of every decision. * Thank you to the surgeon colleagues who generously shared their most intimate ethical dilemmas. ** Yes, I am aware a tie back or a torn ACL repair are not necessarily “elective” surgeries. Dr. Phil Zeltzman is a board-certified veterinary surgeon and author. His traveling surgery practice takes him all over eastern Pennsylvania and western New Jersey. Visit his websites at DrPhilZeltzman.com and VeterinariansInParadise.com. AJ Debiasse, a technician in Stroudsburg, Pa., contributed to this article.